To get to Pindul Cave, you may take public transportation or the private one. For public transportation, take the bus to Wonosari City. From the bus station, get one of the motor taxies, the driver will take you until the cave. If you use private transportation, take the route toward Wonosari and follow the direction to Bejiharjo. The travel will take around 2 hours. 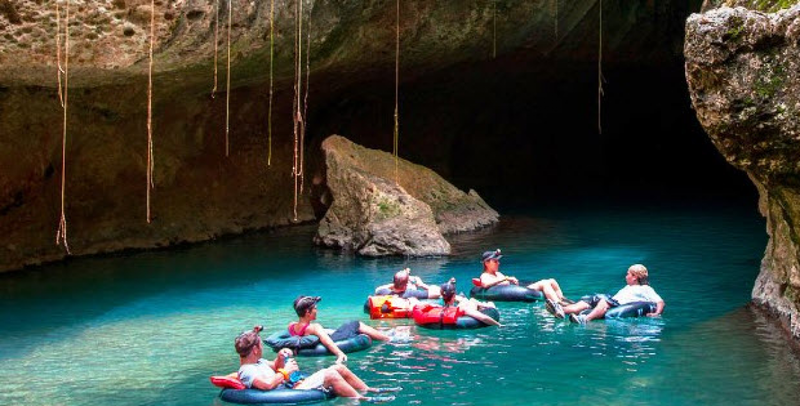 The best time for tubing at Pindul Cave is when dry season happens thus there will be no rain. The activity is too dangerous as rain will generate flood happen below the ground. Moreover, the geology structure of the area is karts. Water will easily infiltrate the limestone and add the water volume below. For this exceptional experience at Pindul Cave, the cost is rather cheap. You have to pay $1 for entrance fee the additional more or less $10 for each tubing or body rafting. There’s also another combination package of $17 for tubing and body rafting. Many recommend taking the package offer since it cheaper and you’ll get a complete experience at once. The cost has covered the tube rent fee and also the safety pieces of equipment such as lifebelt, live vest, and headlamp along with the guide. The duration you will spend inside the earth is around 45 to 60 minutes long. This one preparation is a basic need that you have to know but will be reminded again here. Do bring extra clothes for a change. The activity you’re going to do is related to water, so its bound to get wet. Of course, you would not want to stay wet until your clothes dry on its own. The worst scenario is you’re going to get flu the next day. It said the best time for caving Pindul Cave is from 9 AM to 10 AM, as long as the water is not too cold. If you’re using public transportation, it rather stays at somewhere close than in Yogyakarta city. That way you don’t need to rush in heading the bus station. You can take your time to do something else until the cave is open for visitors. Pindul Cave is one of the caves with underground rivers below the earth of Bejiharjo. The karts morphology gave this privilege for the village. Among the others, Pindul is undeniable the oldest (discovered and became a tourist attraction). The activity is safe enough, as long as you always hear the guide’s advice.